It is fair to say that prior to visiting, almost everything I knew (or thought I knew) about Philadelphia came from films, most recently Nicolas Cage’s National Treasure. Consequently I expected to find a lot of history in Philly and I wasn’t disappointed. I also expected a lot of cream cheese but that turned out to be a common misconception. The forecast for the week had the best of the weather at the beginning so we walked from our new Airbnb in the south to the city centre. Like any city there is a vast range of affluence and poverty evident as you walk around and the closer we got to Independence Hall the less rubbish we saw on the streets, each block slightly more gentrified than the last. South Street, with its vast range of quirky shops and restaurants is a big draw and Head House Square reminded us of a lovely old English market town; even the weather was dreary! 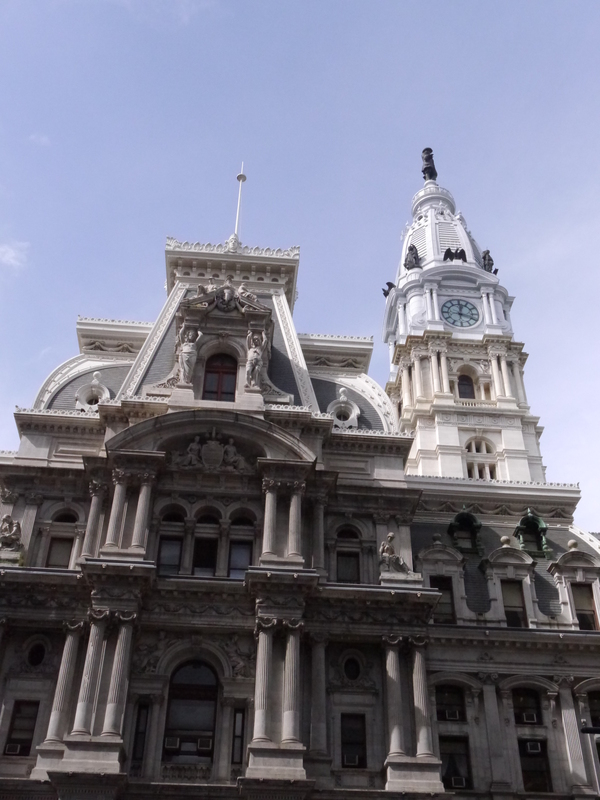 We debated buying CityPASSes which give heavily discounted entry to some of Philadelphia’s best known attractions. The mooted disadvantage of such passes is that they tend to be limited to the most popular places and once you buy them you feel obliged to visit them all at the expense of other hidden treasures you might uncover if you were to wander off the well beaten tourist track. I suppose at this point in our journey we still feel very much like “tourists” as opposed to “travellers” in the conventional sense but sometimes the reason that a place is popular is because it truly is world class and worth a look. The Franklin Institute, for example, falls very definitely in that category and we didn’t feel that its popularity was a reason to give it a miss. Thankfully we have found that the advantage of travelling in the Autumn is that most places (the Papal visit aside!) have been much quieter than expected. In the end we couldn’t resist a bargain and invested in the CityPASSes which meant that I would finally get my coveted bus tour (2 days of hop-on, hop-off bus tours are included with the Philadelphia ticket). Jumping on just outside the Independence Visitor Center, we stayed on the bus for the whole route, listening to our tour guide Mike’s fascinating insight into the locality. 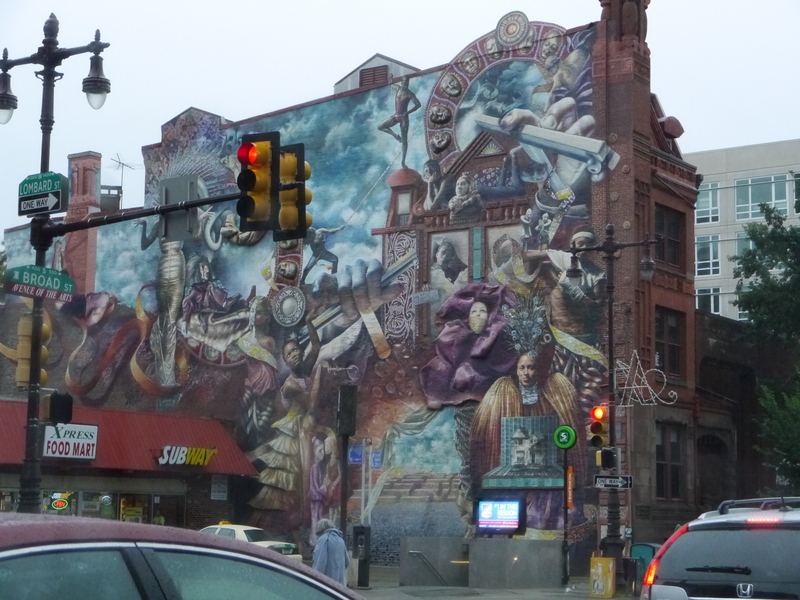 There are two things that Philadelphia has in huge abundance; history and street art. Mike spoke at length about the places and people that forged Philly’s history: About the English Quaker William Penn who founded the city and established the grid system now so common in the US; about the meetings between John Adams, Benjamin Franklin and George Washington that led to the Declaration of Independence, the Constitution and the Bill of Rights; all signed in Philadelphia. We learned about City Hall, the largest masonry building in the world, it has no steel structure and was built one stone at a time taking over 30 years to complete. A 27 tonne bronze statue of William Penn stands on the tower – the tallest statue on top of a building anywhere in the world. Mike was less enthusiastic about the street art. 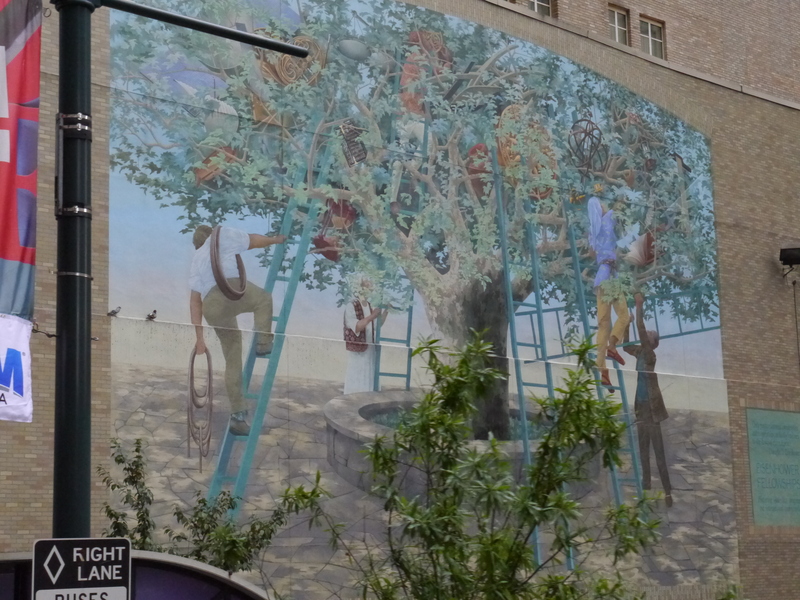 Under Philadephia’s Redevelopment Authority charter developers who build in the city are required to set aside 1% of their budget for street art, which means there is a great deal to see here. 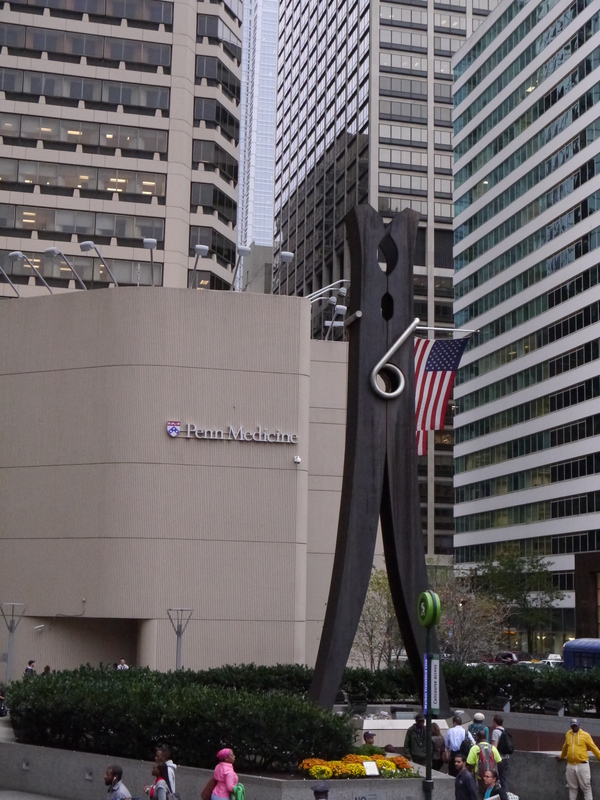 Mike was pretty scathing about the 1976 Clothespin, for example, which he feels adds little to the area. Jess, our guide the following day, was far more appreciative of the sculpture, pointing out the couple embracing and the numerals “76” formed by the pin’s spring, a coincidental nod to the bicentennial. 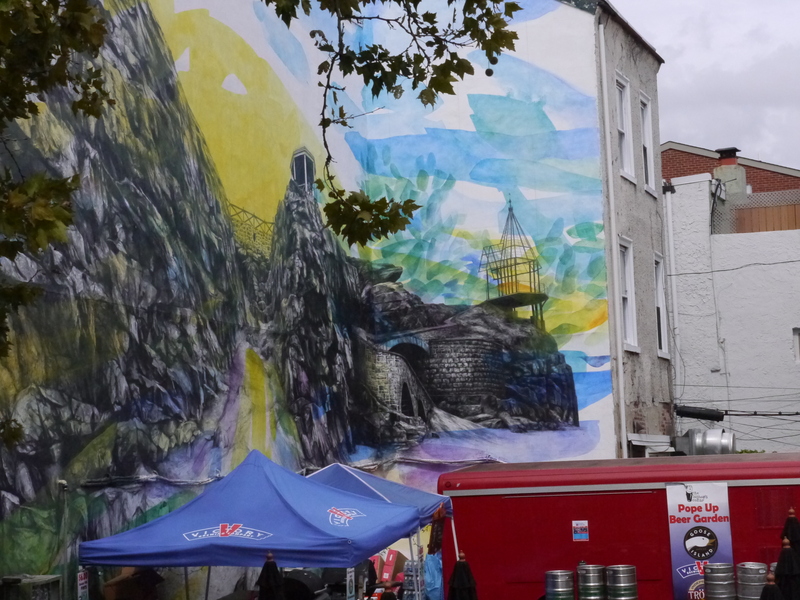 There are more than 3800 murals spread over the city’s walls, part of a programme that has been running since the mid 1980s to engage graffiti artists in constructive public art projects. In truth none of our family could really be described as appreciative of traditional art but these murals do capture the imagination and I could quite happily have spent several hours admiring many more than the handful we managed to see. If I’m honest, before taking the tour, the real attraction of the bus ride for me was being able to see a greater area of the city without any more walking! I think cynically, I had expected some kind of cheesy, low budget commentary that encouraged us all to spend our money wherever the guides’ friends and relatives worked. Instead what we got from the three guides we met on the Philadelphia Big Bus tour was their unique insights into various parts of the city. They were all engaging, entertaining and above all very interesting and I’m so so glad we did it. Oh and by the way, Philadelphia cream cheese – it comes from New York!